Nashville, TN – Award-winning musical artist Ginny Owens will perform at the Women's Breakfast on Monday, February 24, during the NRB 2014 International Christian Media Convention in Nashville, TN. “I am so glad to have Ginny Owens join us for the Women's Breakfast this year,” expressed NRB President & CEO Dr. Jerry A. Johnson. "Her unique musical style and inspirational lyrics have not only appealed to Christian music listeners but also to broader audiences. Moreover, through her life, Ginny has inspired so many. She will be such a blessing to have at Convention." Born and raised in Jackson, MS, Ginny Owens was discovering melodies on the piano almost before she could complete a sentence. Songs began to emerge from her fingers as the vision began to leave her eyes, and by the age of three, a degenerative eye condition left Ginny completely blind. Despite her physical challenge, she pursued a music career. Today, Owens is a top performer on the Christian radio charts; a three-time Dove Award winner, including the Gospel Music Association’s "2000 New Artist of the Year" recipient; and a multiple ASCAP Award winner. 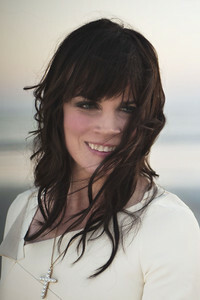 Moreover, Owens has sold nearly one million albums and her music has impacted mainstream audiences at Lilith Fair, the Sundance Film Festival, and the White House. Her music has also received widespread film and television placement, including songs on the popular WB series’ Roswell and Felicity.